"DaimlerChrysler" redirects here. For the now-unaffiliated American automobile manufacturer, see Chrysler. Daimler AG (German pronunciation: [ˈdaɪmlɐ ʔaːˌɡeː] ( listen); previously named Daimler-Benz and DaimlerChrysler) is a German multinational automotive corporation, headquartered in Stuttgart, Baden-Württemberg. Daimler-Benz was formed with the merger of Benz & Cie and Daimler Motoren Gesellschaft in 1926. The company was renamed DaimlerChrysler upon acquiring the American automobile manufacturer Chrysler Corporation in 1998, and was again renamed Daimler upon divesting of Chrysler in 2007. As of 2014, Daimler owned or had shares in a number of car, bus, truck and motorcycle brands including Mercedes-Benz, Mercedes-AMG, Smart Automobile, Detroit Diesel, Freightliner, Western Star, Thomas Built Buses, Setra, BharatBenz, Mitsubishi Fuso, MV Agusta as well as shares in Denza, KAMAZ and Beijing Automotive Group. The luxury Maybach brand was terminated at the end of 2012, but revived in April 2015 as "Mercedes-Maybach" versions of the Mercedes-Benz S-Class and G-Class. In 2017, Daimler sold 3.3 million vehicles. By unit sales, Daimler is the thirteenth-largest car manufacturer and is the largest truck manufacturer in the world. Daimler provides financial services through its Daimler Financial Services arm. The company is a component of the Euro Stoxx 50 stock market index. 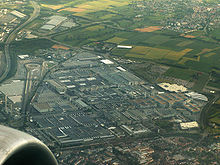 Daimler AG complex in Stuttgart include central company headquarters, Mercedes-Benz and Daimler car plants, Mercedes-Benz museum and stadium Mercedes-Benz Arena. Daimler AG's origin is in an Agreement of Mutual Interest signed on 1 May 1924 between Benz & Cie (founded 1883 by Karl Benz) and Daimler Motoren Gesellschaft (founded 1890 by Gottlieb Daimler and Wilhelm Maybach). Both companies continued to manufacture their separate automobile and internal combustion engine marques until 28 June 1926, when Benz & Cie. and Daimler-Motoren-Gesellschaft formally merged - becoming Daimler-Benz AG (Aktiengesellschaft) - and agreed that thereafter, all of the factories would use the brand name of "Mercedes-Benz" on their automobiles. The inclusion of the name Mercedes in the new brand name honored the most important model series of DMG automobiles, the Mercedes series, which were designed and built by Wilhelm Maybach. They derived their name from a 1900 engine named after the daughter of Emil Jellinek. Jellinek became one of DMG's directors in 1900, ordered a small number of motor racing cars built to his specifications by Maybach, stipulated that the engine must be named Daimler-Mercedes, and made the new automobile famous through motorsports. That race car later became known as the Mercedes 35 hp. The first of the series of production models bearing the name Mercedes had been produced by DMG in 1902. Jellinek left the DMG board of directors in 1909. The name of Daimler as a marque of automobiles had been sold by DMG - following his death in 1900 - for use by other companies (Daimler Motor Company and Austro-Daimler). Since the new company, Daimler-Benz, would have created confusion and legal problems by including Daimler in its new brand name, it therefore used the name Mercedes to represent the Daimler-Motoren-Gesellschaft interest. Karl Benz remained as a member of the board of directors of Daimler-Benz AG until his death in 1929. Although Daimler-Benz is best known for its Mercedes-Benz automobile brand, during World War II, it also created a notable series of aircraft, tank, and submarine engines. Daimler also produced parts for German arms, most notably barrels for the Mauser rifle. During World War II, Daimler-Benz employed slave labour. In 1966, Maybach-Motorenbau GmbH merged with Mercedes-Benz Motorenbau Friedrichshafen GmbH to form Maybach Mercedes-Benz Motorenbau GmbH, under partial ownership by Daimler-Benz. The company is renamed Motoren und Turbinen-Union Friedrichshafen GmbH (MTU Friedrichshafen) in 1969. In 1989, Daimler-Benz InterServices AG (Debis) was created to handle data processing, financial and insurance services, and real estate management for the Daimler group. In 1995, MTU Friedrichshafen became a wholly owned subsidiary of Daimler-Benz. In a so-called "Merger of Equals," or "Marriage made in Heaven", according to its then CEO and architect Jürgen E. Schrempp, Daimler-Benz AG and United States-based automobile manufacturer Chrysler Corporation, the smallest of the main three American automakers, merged in 1998 in an exchange of shares and formed DaimlerChrysler AG. Valued at US$38 billion, it was the world's largest ever cross-border deal. The terms of the merger allowed Daimler-Benz's non-automotive businesses such as Daimler-Benz InterServices AG, "debis AG" for short, (created in 1989 to handle data processing, financial and insurance services, and real estate management for the Daimler group) to continue to pursue their respective strategies of expansion. debis AG reported revenues of $8.6 bn (DM 15.5 bn) in 1997. In 2000, DaimlerChrysler acquired the Detroit Diesel Corporation and placed its on-highway division under Daimler Trucks North America. The off-highway division was placed under MTU Friedrichshafen to form'MTU America. Detroit Diesel branding has been maintained by DTNA and MTU America. In 2005, MTU-Friedrichshafen was sold to the Swedish investment firm EQT Partners. DaimlerChrysler had reportedly approached other carmakers and investment groups to sell Chrysler in early 2007. General Motors was reported to be a suitor, but on 3 August 2007, DaimlerChrysler completed the sale of Chrysler Group to Cerberus Capital Management. The original agreement stated that Cerberus would take an 80.1 percent stake in the new company, Chrysler Holding LLC. DaimlerChrysler changed its name to Daimler AG[note 1] and retained the remaining 19.9% stake in the separated Chrysler. The terms saw Daimler pay Cerberus US$650 million to take Chrysler and associated liabilities off its hands. Of the US$7.4 billion purchase price, Cerberus Capital Management was to invest US$5 billion in Chrysler Holdings and US$1.05 billion in Chrysler's financial unit. The de-merged Daimler AG received US$1.35 billion directly from Cerberus but directly invested US$2 billion in Chrysler itself. Chrysler filed bankruptcy in 2009. In April 2017 it announced a partnership with Via, a New York-based ride-sharing app, to launch a new ride-sharing service across Europe. In September, it was announced that Daimler had led a fundraising round for car-sharing start up Turo, which is a platform that lets owners rent their vehicles out to other users. It also acquired Flinc, a German startup that has built an app for peer-to-peer-style carpooling, has invested in Storedot, Careem, Blacklane and FlixBus, and has acquired car2go and mytaxi. Britta Seeger: Head of Mercedes-Benz Cars Marketing and Sales. Ola Källenius: Head of Group Research and Mercedes-Benz Cars Development. The board of management had had eight members before the unexpected resignation on 28 January 2014 of Andreas Renschler, former head of Manufacturing and Procurement Mercedes-Benz Cars & Mercedes-Benz Vans. It returned to full strength on 1 January 2015 with the appointment of Swedish-born Ola Källenius as head of Mercedes-Benz Cars Marketing and Sales. As of May 2015[update], the twenty members of Daimler AG's supervisory board are: Manfred Bischoff (Chairman), Michael Brecht (Deputy Chairman), Paul Achleitner, Sari Baldauf, Michael Bettag, Bernd Bohr, Clemens Börsig, Jürgen Hambrecht, Petraea Heynike, Andrea Jung, Joe Kaeser, Ergun Lümali, Sabine Maaßen, Wolfgang Nieke, Bernd Pischetsrieder, Valter Sanches, Jörg Spies, Elke Tönjes-Werner, Frank Weber, Roman Zitzelsberger. by region 29.2% Europe (excluding Germany), 36.4% German, 24.3% United States, 6.8% Kuwait, 2.9% Asia, 0.4% Others. In November 2014, Daimler announced it would acquire 25 percent of Italian motorcycle producer MV Agusta for an undisclosed fee. MV Holding acquired the 25 percent of MV Agusta back from Daimler in December 2017. China's automobile manufacturer, Geely Group Co., Ltd, took a 9.69% stake in the company, through a subsidiary, in February 2018, making it the company's largest single shareholder. In September 2018, Daimler invested $155 million in Electric Bus Maker Proterra. On 5 March 2015, Daimler AG announced a 1,200-job package to the North Charleston region for its van plant, to allow the company to start manufacturing Mercedes-Benz Sprinter vans from scratch to meet demand in North America. From 2010, these vans were set up in Germany, then shipped to the United States partially disassembled for reassembly to avoid import tariffs. A Daimler official said that the Sprinter’s popularity in North America was making that process less efficient. The North Charleston plant had been employing only 100 workers. The Sprinter is available on the U.S. market as a panel van, crew bus and chassis in several variants with three lengths and roof heights, six-cylinder diesel or gasoline engines. The Sprinter has been assembled and sold in the United States since 2001. The Daimler AG has a worldwide networks of production plants and research centers. The following list is a description of all locations worldwide that include a Daimler plant, including plants for Daimler subsidiaries EvoBus, Daimler Trucks North America, Detroit Diesel, Freightliner Trucks and Mitsubishi Fuso Truck and Bus Corporation. The list excludes Daimler Financial Services locations. Until the end of 2011, the company had also held shares in McLaren Group. On 7 April 2010, Renault-Nissan executives, Carlos Ghosn and Dr. Dieter Zetsche announced a partnership between the three companies. The first fruits of the alliance in 2012 included engine sharing (Infiniti Q50 utilising Mercedes diesel engines) and a re-badged Renault Kangoo being sold as a Mercedes-Benz Citan. In 2016, Daimler subsidiary ACCUMOTIVE announced their stationary batteries, to store up to 20 kWh of solar power for later use. Daimler plans to invest €1.5 billion in battery technology, and unveiled a factory in Kamenz in May 2017. Mercedes-Benz launched its first passenger car model equipped with a hybrid drive system in summer 2009, the Mercedes-Benz S-Class 400 Hybrid. and the Citaro Hybrid bus in 2007. Daimler Trucks and Mitusbishi Fuso have also trialed various hybrid models including the Mitsubishi Fuso Canter Eco Hybrid and Mitsubishi Fuso Aero Star Aero Star Eco Hybrid bus. On 16 November 2009, Daimler (45.1%) and Aabar Investments (30%) purchased a 75.1% stake in Brawn GP. The company was rebranded as Mercedes GP with its base in Brackley, UK, with Ross Brawn remaining team principal. The Brawn purchase led to Daimler selling back its stake in McLaren in stages, completed in 2011. Mercedes continued to provide sponsorship and engines to McLaren until 2015, after which McLaren switched to engines from Honda. Prior to the 2011 season, Daimler and Aabar Investments purchased the remaining 24.9% stake owned by the team management in February 2011. In November 2012 Aabar Investments sold its remaining shares, leaving the team (rebranded as Mercedes AMG Petronas F1 Team) wholly Daimler-owned. Daimler also owns Mercedes AMG High Performance Powertrains which, as of 2017, supplied engines to Force India and Williams, in addition to Mercedes AMG Petronas. On 1 April 2010, Daimler AG's German and Russian subsidiaries each pleaded guilty to two counts of bribery charges brought by the U.S. Justice Department and the U.S. Securities and Exchange Commission. The parent company made a US$185 million settlement, but the company and its Chinese subsidiary remained subject to a two-year deferred prosecution agreement requiring further cooperation with regulators, adherence to internal controls and meeting other terms before final sentencing. Daimler would face harsher penalties should it fail to meet the terms of the agreement during the two-year period. According to the charges, the bribes were frequently made by over-invoicing customers and paying the excess back to top government officials or their proxies. The bribes also took the form of luxury European vacations, armored Mercedes vehicles for high-ranking government officials and a birthday gift to the then notorious[according to whom?] dictator of Turkmenistan, Turkmenbashi (Saparmurat Niyazov), including a golden box and 10,000 copies of his personal manifesto, Ruhnama, translated into German. U.S. prosecutors further alleged that some bribes were paid through shell companies based in the U.S. "In some cases Daimler wired these improper payments to U.S. bank accounts or to the foreign bank accounts of U.S. shell companies in order to transmit the bribe", the court papers said. "Using offshore bank accounts, third-party agents and deceptive pricing practices, [Daimler AG, its subsidiaries and affiliates] saw foreign bribery as a way of doing business," said Mythili Raman, a principal deputy in the Justice Department's criminal division. Judge Richard J. Leon of the United States District Court in Washington, D.C., approved the plea agreement and settlement, calling it a "just resolution". Daimler AG will be open a vocational schools in Zambia in September 2019. ^ Press release by Tata Group Jaguar now shares the rights to the Daimler name with Daimler AG, the German car manufacturer created when DaimlerChrysler was split up. Jaguar agreed terms in 2007 which allow the German company to use the Daimler brand as the title of a trading company, a trade name or a corporate name – rights that it did not hold previously. The renegotiated terms did not affect Jaguar's rights to build Daimler cars. A spokesman for Jaguar said: “The extended usage agreement does not affect either company's existing right to use the Daimler name for a product.” — The Times 28 July 2008. ^ a b c d e f g "Daimler AG, 2018 Annual Reports" (PDF). Daimler AG. Retrieved 13 March 2019. ^ "Shareholder Structure". Daimler AG. Retrieved 16 November 2018. ^ "Daimler AG 2017 Fact Sheet" (PDF). Daimler AG. Archived from the original (PDF) on 1 March 2018. Retrieved 28 February 2018. ^ "DaimlerChrysler AG - The History of Daimler-Benz AG". Retrieved 27 January 2011. ^ "Merger is 'a marriage made in heaven'". BBC News. 7 May 1998. ^ "COMPANY NEWS; DAIMLER-BENZ AND CHRYSLER REVISE RATIO FOR STOCK SWAP". The New York Times. 9 June 1998. Retrieved 7 October 2011. ^ "DaimlerChrysler dawns". CNN Money. 7 May 1998. Retrieved 12 April 2013. ^ "Daimler-Benz and Chrysler merge". 7 May 1998. Retrieved 27 January 2011. ^ "DaimlerChrysler AG – The History of Daimler-Benz AG". Retrieved 27 January 2011. ^ "DaimlerChrysler settles investor lawsuit". CarAndDriver.com. 25 August 2003. Archived from the original on 26 September 2007. Retrieved 23 July 2007. ^ "Taken for a Ride". Bloomberg BusinessWeek. 5 June 2000. Archived from the original on 21 October 2007. Retrieved 6 November 2007. ^ "Chrysler Group to Be Sold for $7.4 Billion". The New York Times. 14 May 2007. ISSN 0362-4331. Retrieved 9 November 2017. ^ "Chrysler Announces Major Downsizing – Daily Auto Insider". CarAndDriver.com. 15 February 2007. Archived from the original on 19 February 2007. Retrieved 15 March 2007. ^ Healey, James (13 October 2008). "GM and Chrysler consider merger". USA Today. Retrieved 11 April 2013. ^ "Home – Cerberus Takes Over Majority Interest in Chrysler Group and Related Financial Services Business for EUR 5.5 Billion ($7.4 billion) from DaimlerChrysler". Daimler. Archived from the original on 11 December 2009. Retrieved 27 September 2010. ^ Roubini, Nouriel (7 May 2009). "The Impact Of Chrysler's Bankruptcy". Forbes. Retrieved 6 March 2014. ^ a b c Lunden, Ingrid. "Daimler acquires German P2P carpooling startup Flinc". Techcrunch.com. Retrieved 21 October 2017. ^ "Daimler and Via to launch ride-sharing shuttle service in Europe". Engadget.com. Retrieved 21 October 2017. ^ Griswold, Alison. "Car-sharing startup Turo raised another $92 million to help people pay for their dream cars". Qz.com. Retrieved 21 October 2017. ^ "Ask Dr. Z - Intro". youtube.com. c. 2007. Archived from the original on 25 April 2014. Retrieved 25 April 2014. ^ Communications, Daimler Corporate. "Daimler AG and Investor Consortium Continue Agreement on EADS". Prnewswire.com. Retrieved 2 June 2017. ^ "Establishment of Daimler Trucks and Buses China Ltd" (PDF). Ar2013.daimler.com. Retrieved 21 October 2017. ^ "MV holding: acquisitions and investments". mvagusta.com. 17 December 2017. ^ "Geely Founder Li Shufu is a New Shareholder of Daimler AG". Cision PR Newswire. 24 February 2018. ^ Ohnsman, Alan. "Next Stop Unicorn? Daimler Leads $155 Million Round For Silicon Valley Electric Bus Maker Proterra". Forbes. Retrieved 20 September 2018. ^ "Mercedes announces $500 million expansion of N. Charleston plant, new jobs". Live5News.com. Retrieved 2 June 2017. ^ Schultz, Jonathan (16 August 2012). "At Last, the Maybach Is Priceless". The New York Times. Retrieved 1 February 2013. ^ "Daimler Business Units". Daimler AG. Retrieved 12 November 2014. ^ "Welcome to Mercedes Benz Research & Development India". mbrdi.co.in. Retrieved 8 September 2016. ^ "Mercedes Benz - Corporativo". AutobusesMercedesBenz.com.mx. Archived from the original on 24 June 2017. Retrieved 2 June 2017. ^ "Daimler buys into Agusta as motorbike and car tech converge". Reuters. 31 October 2014. Retrieved 17 June 2015. ^ "Daimler Exits EADS in $2.9 Billion Disposal to Fix Cars". Bloomberg.com. 17 April 2013. Retrieved 21 October 2017. ^ Bryant, Chris (1 February 2013). "Daimler takes stake in Chinese carmaker". Financial Times. Retrieved 11 April 2013. ^ "Foton and Daimler in Truck Joint Venture". ChinaAutoWeb.com. Retrieved 26 July 2010. ^ Moffett, Sebastian (7 April 2010). "Daimler, Nissan, Renault Set Small-Car Cooperation". The Wall Street Journal. Retrieved 7 April 2010. ^ "Mercedes engines for new Infiniti Q50". MSN Autos. 7 February 2013. Retrieved 11 April 2013. ^ "Mercedes-Benz Citan (2013 – )". Honest John. 18 March 2013. Retrieved 11 April 2013. ^ "Daimler announces deal with RWE, 500 Berlin charging points, lithium Smart". Autoblog.com. ^ KRAEMER, Susan (9 August 2009). "Smart EV Tries Tesla Batteries in Next U.K.Trial". Gas 2. Retrieved 11 April 2013. ^ Davis, Joshua (27 September 2010). "How Elon Musk Turned Tesla Into the Car Company of the Future". Wired. Archived from the original on 24 June 2016. Retrieved 10 October 2016. ^ SQUATRIGLIA, Chuck (13 January 2009). "Tesla Motors Joins Daimler on a Smart EV". Wired. Retrieved 11 April 2013. ^ Baker, David R. (31 May 2016). "Elon Musk: Tesla was founded on 2 false ideas, and survived anyway". San Francisco Chronicle. Retrieved 10 August 2016. ^ "BYD and Daimler in EV Joint Venture". ChinaAutoWeb.com. Retrieved 26 July 2010. ^ Kristen Hall-Geisler (28 April 2016). "Mercedes home batteries are a potential rival for Tesla's Powerwall". TechCrunch. AOL. Retrieved 30 April 2016. ^ "Daimler announces a €500 million investment in a new battery factory in Germany". Electrek.co. 1 March 2016. Retrieved 21 October 2017. ^ "Daimler to rein in investments after EVs prompt surge". Autonews.com. Retrieved 21 October 2017. ^ "Daimler unveils its own new battery Gigafactory for electric vehicles". Electrek. 22 May 2017. Retrieved 22 May 2017. ^ Ingram, Antony (28 January 2013). "Daimler, Ford, Nissan Agree To Share Hydrogen Fuel-Cell Costs For 2017 Or Later". The Washington Post. Archived from the original on 19 April 2013. Retrieved 11 April 2013. ^ "Ford, Renault-Nissan and Daimler agree fuel cell deal". BBC News. 28 January 2013. Retrieved 11 April 2013. ^ "Newsroom | Daimler > Sustainability". Daimler. Archived from the original on 1 April 2009. Retrieved 1 May 2009. ^ "Archer Daniels Midland Company, Bayer CropScience and Daimler to Cooperate in Jatropha Biodiesel Project". DaimlerChrysler. Archived from the original on 23 March 2009. ^ Straw, Edd (16 November 2009). "Mercedes takes over Brawn". Autosport. Retrieved 16 November 2009. ^ "McLaren buy back 40% stake of company from Mercedes". The Guardian. 18 March 2010. Retrieved 14 July 2014. ^ Benson, Andrew (19 May 2013). "Formula 1: Honda to return in 2015 as McLaren engine supplier". BBC Sport. Retrieved 14 July 2014. ^ Kassem, Mahmoud (19 November 2012). "Aabar Sells Stake in Mercedes Formula One Team to Daimler". Bloomberg News. Retrieved 14 July 2014. ^ Elizalde, Pablo (28 March 2013). "Force India to run F1 Mercedes engines from 2014 onwards". Autosport. Retrieved 14 July 2014. ^ Straw, Edd (30 May 2013). "Williams to use Mercedes engines from 2014 Formula 1 season". Autosport. Retrieved 14 July 2014. ^ a b Jeremy Pelofsky (1 April 2010). "U.S. judge OKs settlement in Daimler bribery case". Reuters. Retrieved 3 April 2010. ^ Fuhrmans, Vanessa (24 March 2010). "Daimler Agrees to Pay $185 Million to Settle U.S. Bribery Investigation". The Wall Street Journal. Retrieved 3 April 2010. ^ Julia Kollewe (24 March 2010). "Daimler 'agrees $185m fine' to settle US corruption investigation | Business". The Guardian. London. Retrieved 3 April 2010. ^ Reuters (24 March 2010). "Daimler's Settlement in Bribery Case Is Approved". The New York Times. Retrieved 3 April 2010. ^ "UPDATE: US Judge Approves Settlement In Daimler Bribery Case". FOXBusiness.com. 1 October 2006. Archived from the original on 24 February 2014. Retrieved 24 February 2014. ^ "Plaintiff : United States of America v. Defendant : DAIMLER AG, : CRIMINAL NO. : 1:10-CR-063" (PDF). Justice.gov. Retrieved 21 October 2017. ^ "The Daimler Settlement at the FCPA Blog with links to documents of the case". Fcpablog.com. 1 April 2010. Retrieved 27 September 2010.